The Museum of Contemporary Art (MOCA) in Los Angeles will be exhibiting, Black Panther: The Revolutionary Art of Emory Douglas, running October 21st, 2007 through January 20th, 2008. The exhibit takes place at the MOCA annex located at the Pacific Design Center in West Hollywood, California. Approximately 150 works created by Douglas while he was the Minister of Culture for the Black Panther Party will be on display, with the legendary artist scheduled to attend the special opening reception celebration to be held at the Pacific Design Center on Saturday, Oct. 20, 2007, at 6:00 pm. That event is free and open to the public. 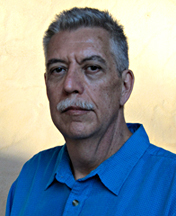 As a teenager in the late 1960’s, I was embroiled in the issues of the day, from the struggle to end the war in Vietnam to the countless attempts at uprooting and eradicating racism in the United States. I was a reader of the Black Panther Party newspaper, and like many other young people across the country, avidly collected the pull-out posters and graphics Douglas published in the paper. Unfortunately I’ve lost the bulk of my collection - but the fiery exhortations of those artworks remain forever burned in my memory. 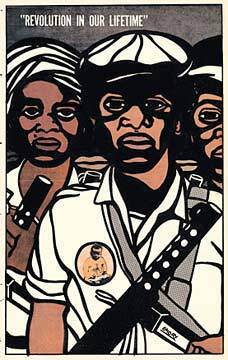 Numerous misconceptions are still held regarding the Panthers and their legacy, but to me their ideas were brilliantly represented in the artworks created by Emory Douglas. The MOCA exhibit offers a glimpse of recent American history that has become effectively buried and put out of mind - but it’s a history we cannot afford to forget. If I had to pick a single image by Douglas that exemplified Panther ideology - it would be the artist’s poster depiction of a young party militant, gun slung over shoulder, peddling a Panther newspaper bearing the headline, “All Power To The People.” That militant slogan best summed up the Panther political platform, but the axiom should also be seen as the core principal behind any genuine political democracy. The poster mentioned is the lead image displayed on the MOCA website, where nine images from the exhibition are on view. At 3:00 pm on Sunday, Oct. 21, 2007, Emory Douglas will discuss with the public, the graphic art he created with the Black Panther Party. All are welcome to this free event. After the talk, Douglas will sign copies of his book - Black Panther: The Revolutionary Art of Emory Douglas. Instead of an official museum catalog, the exhibit will be accompanied by this book, which was published by Rizzoli in Feb. 2007. The book contains essays by Kathleen Cleaver, Bobby Seale, Amiri Baraka, Sam Durrant, and Danny Glover, along with dozens of full color reproductions of artworks and posters created by Douglas that originally appeared in the Black Panther Party newspaper. MOCA’s Pacific Design Center gallery is located at; 8687 Melrose Avenue, Design Plaza G102, West Hollywood, California. 90069. Phone: 310-289-5223. 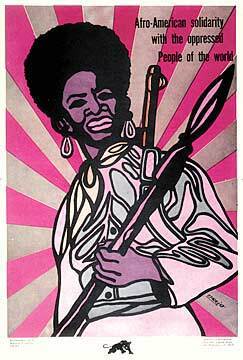 Admission to the Emory Douglas exhibit is free.